SCOTTSDALE, Ariz. – Dec. 29, 2015 – Barrett-Jackson, The World’s Greatest Collector Car Auctions®, is set to ignite the auction block with a fantastic collection of General Motors performance cars during the nine-day 45th Anniversary Auction from Jan. 23-31, 2016, at WestWorld of Scottsdale. The 45th Anniversary docket will feature over 1,400 rare and exceptional vehicles, most selling at No Reserve.Included in the line-up is an authentic X66 Double COPO Yenko Camaro, a 1969 L88 Corvette, a highly coveted 1971 GTO Judge convertible and two Buick big-block muscle cars. As one of the rarest of Yenko Camaros made, an authentic 1969 X66 Double COPO Yenko Camaro (Lot #1390) being auctioned at No Reserve features both the COPO 9561 package and the very rare COPO 9737 sports car conversion package. This high-octane Camaro underwent a complete restoration to exacting original condition, resulting in a highly detailed concours-quality appearance. Features include the L72 427/425hp engine, Muncie 4-speed and heavy-duty 4:10 posi-traction rear end as well as a rare140 mph speedometer, larger front sway bar and 15×7″ Rallye wheels. 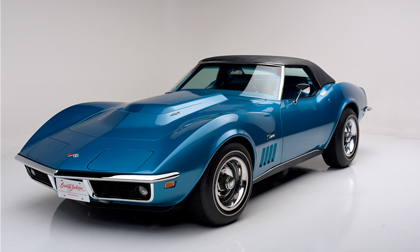 Another one of the 45th Anniversary highlights will be astunning1969 Chevrolet Corvette L88 convertible (Lot #1369). Painted LeMans Blue, the L88 is one of 116 built in 1969 (the final year of availability) and is well-known among auto historians. Having been in storage for nearly 25 years, the machine recently underwent an all-encompassing frame-off restoration and wasreturned to its as-built state. Documentation includes an overview of performed work with accompanying receipts, an NCRS report and validation service, as well as the original Tank Sticker. A 1971 GTO Judge Convertible (Lot #1343) for sale is one of only 17 ever built. Featuring a fresh coat of Castilian Bronze (Code 67) paint, the convertible underwent a no-expense-spared, frame-off restoration and features a complete rebuild. Under the hood, this GTO Judge comes equipped with a 455 high-output engine with Ram Air “197” cylinder heads. The restoration on the GTO is 100-percent“factory correct,”including T-3 headlamps and original-style Firestone white lettered tires. Documentation includes a complete set of Pontiac Historic Services paperwork and Pontiac Division Window Sticker. Also crossing the block are two period-correct 1970 big-block Buicks selling at No Reserve. One of only 84 4-speeds with a 455 V8, this rare, matching-numbers, original California Buick Gran Sport (Lot #1022) features functional Ram Air hood, power windows, power bucket seats, air conditioning, power steering and disc brakes and a dual exhaust with N25 rear bumper with tips. Painted a beautiful Cornet Gold with black vinyl top, bucket seats and chromed magnum-style 5-spoke wheels, it is an excellent example of GM big-block muscle. Another big-block Buick heading to auction is one of 678 fully authenticated factory-produced 1970 Buick GSX (Lot #1064). Powered by a rebuilt 455 and an automatic transmission, the GSX is finished in its original color “QQ” Saturn Yellow and black interior. To preview additional GM vehicles consigned for the 2016 Barrett-Jackson 45th Anniversary Auction in Scottsdale, click here. For more information on becoming a bidder, follow the link to www.barrett-jackson.com/bid. Experience the 45th Anniversary Scottsdale Auction in style with a Barrett-Jackson VIP Experience Package. Information on available packages and how to be a part of this world-class lifestyle event is available here. Established in 1971 and headquartered in Scottsdale, Arizona, Barrett-Jackson, The World’s Greatest Collector Car Auctions®, is the leader in collector car auctions and automotive lifestyle events. The company produces auctions in Scottsdale, Arizona; Palm Beach, Florida; at Mohegan Sun in Connecticut, and Las Vegas, Nevada. With broadcast partners, Velocity and Discovery Channel, Barrett-Jackson will feature live television coverage in 2016, including broadcasts in over 100 countries internationally. Barrett-Jackson also endorses a one-of-a-kind collector car insurance for collector vehicles and other valued belongings. For more information about Barrett-Jackson, visit http://www.barrett-jackson.com, or call 480-421-6694.